This list of the best success books covers everything you didn’t learn in school. Consider this list your Master’s Degree in success. The books span having a success-oriented mindset, how to develop your people network, and how to effectively take action in meaningful ways. You’ll gain practical tips on money, skills, and everything you need to be highly successful in today’s environment. With the explosion of easy-to-use tools, getting your unique products and services online makes it easier than ever to become an entrepreneur and blaze your own path. Grinders are capitalizing on this modern-day gold rush. Are you? On this site, you’ll find a lot of references to Cogs and Grinders. Here’s a quick breakdown and how they relate to the success books on this list. If you’re “in the grind” as a Cog, that means you’re spending Monday through Friday, 8-5 (or more), working for someone else’s dreams, passions, and riches. Your work realizes someone else’s vision. Your grinding makes someone else millions. Term “grind” for Cogs means monotony. It means your life is a blur. The weekend is over, back to the grind. Even if you earn a solid six-figure salary, have a nice house, and are contributing to your gold 401(k), grinding for someone else can leave you feeling empty. Being a Grinder means you work hard for your personal purpose and goals; not for someone else’s. To leave the grind behind, make no mistake, you need to grind. You need to grind hard. You’re just doing it for yourself, and let me tell you—you’ll love it. As a Grinder, you spend your time building your legacy and your unique imprint on this world. This list will show you the key ingredients needed to be a Grinder. The answer is mindset. They misunderstand the risks. They see becoming a Grinder (more on that term later) as a fantasy—not something regular people do. Books in this section will give you mental practices and new ways to view the world, all of which will have you thinking in a way that will deliver unusually exceptional results. It’s not what you know; it’s who you know. We’ve all heard this saying, and if you want to leave the grind behind, you’ll need to live and breathe it. Even though this concept applies to the Cog world, it applies doubly so to the Grinder world. Humans progress because we learn and advance from those that came before. Grinders know this and don’t re-invent the wheel. You have the ability to level-jump results, avoid pitfalls, and leverage others’ connections. Books in this section will show you how to maximize your network toward your success. Books in this section give you practical tips to help actually convert your energy into tangible action. They cover how to spend your time effectively and how to convert ideas into reality. They also dive into effectively managing your two best resources: money and time. Without further ado, here’s the list of the 22 best books on success, spanning mindset, networking, and action. Most of these are available in audio book format and read by the author. You can earn your “master’s degree” in success while driving to work. Mindset is the success ingredient most of us miss in standard upbringing and education. It’s what Grinders know and Cogs don’t. 1. The Happiness Advantage by Shawn Achor. “Happiness is the precursor to success, not merely the result.” See the science behind happiness causing success, not the other way around. 2. Rapt: Attention and the Focused Life by Winifred Gallagher. Read this great deep dive into studies on how what you think about impacts your life. If you’re a skeptic, this is a great book for you. 3. The Success Principles by Jack Canfield. Define your purpose and execution plan with this truly complete guide to personal success. 4. The Compound Effect by Darren Hardy. Learn the power of proper goal setting and daily action. 5. Super Brain by Depak Chopka, MD, and Rudolph Tanzi, PhD. Modify your conditioning and subconscious behavior to transform most any aspect of your life. 6. The Master Key System by Charles F. Hannel. Become a pro at visualization, allowing you to better prepare for situations and act in them. 7. Psycho Cybernetics by Dr Maxwell Maltz. The best book ever written on the incredible power of visualization and your subconscious. Your personal network gives you the ability to level-jump results, avoid pitfalls, and leverage others’ connections. The books in this list show you how to maximize your mindset and how to get the most from your network. 8. How to Win Friends and Influence People by Dale Carnegie. Learn how to be your best with people A-Z. Learn to ask for what you want. 9. Secrets of Closing the Sale by Zig Ziglar. Sell better and see why sales is one of the most valuable skill you can have. 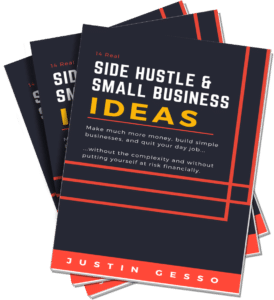 This book helps you interact with your network and be more confident in terms of selling yourself and your ideas. 10. Never Split the Difference by Chris Voss. Learn how to negotiate from a top FBI negotiator. Get better results in every conversation. These books provide practical tips on how to convert your energy into action. They will tell help you with making more money, taking action, and building the skills you need to be successful on your own. 11. Secrets of the Millioniare Mind by T Harv Eker. Ditch poor mental conditioning and think smarter about money. 12. The Millionaire Fastlane by MJ Demarco. Figure out how to really make money and learn all about scalability. 13. The Millionaire Real Estate Investor by Gary Keller. Learn his repeatable model for becoming a millionaire with real estate. 14. Profit First by Mike Michalowicz. Learn how to best track your new income and keep it profitable. 15. The 4-Hour Workweek by Timothy Ferriss. Remove waste from your life, outsource better, use time effectively, and work from home. 16. Write it Down, Make it Happen by Anne Klauser, PhD. Written by a PhD who has studied success, this book dives into the power of written goals and tasks, as well as how lists let you optimize your time. 17. Deep Work by Cal Newport. Develop a system for segmenting your time and focusing in a way that will explode your productivity. 18. The 10X Rule by Grant Cardone. Get motivated to push harder than the next guy and learn the value of action. 19. Scientific Advertising by Claude Hopkins. Market smartly—a critical skill for Grinders. While this book is old, its principles still apply perfectly today. It’s the essence of successfully advertising online and is practically the blueprint for Google Analytics. 20. Cashvertising by Drew Eric Whitman. Use human psychology to improve your marketing. 21. The Copywriter’s Handbook by Robert W. Bly. Choose words wisely. Words trigger action in marketing, so get to know them. 22. Epic Content Marketing by Joe Pulizzi. Create terrific content in a way that will get you noticed. What’s Missing? Leave the Grind Behind! 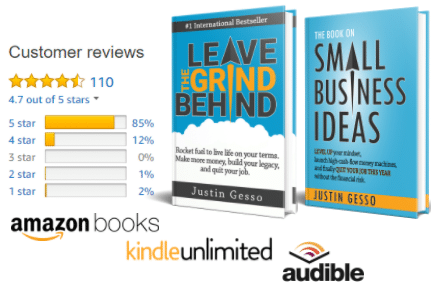 Leave the Grind Behind is the international Best Seller. It is the actionable book that reveals how to make more money, build your legacy, and quit your job.